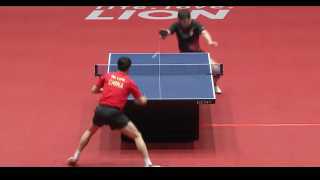 Thread: MA LONG SERVE TRAINING - Slow Motion, Short Form, Rare Private Record. Many thanks from my side for the video! on the on side the service is amazing, on the other the service is hidden... and no one of the officials (referees) says anything. in the slow motion the evidence that ML throw the ball perfectly vertical, but after that he set down the head and the torax over the ball hidind the movement and the moment when the ball is touched by the racket. if this guys, the best of, are allowed tacitly to play hidden services, we, on national/regional level will have no power to avoid this phenomenon, first because no one will be able / has no pleasure to discuss with the opponent (no real objective rule due to interpretation of the seen), second because the example of "the best of" indicates that the hidden way is at end winning. the rule must be revisioned asap!!! While I am not sure ML violated the service rule I really think it is too difficult (or expensive) to enforce the rule. Remember back to the old days when we used to watch how beautiful and tricky Waldner' serves were! Such hidden serves are an art in table tennis and should be allowed! if parallax or not, behind or not, at the end, and as "normal", all players are going to the limit and a little (or more than a litte) over the rule. yes, parallax, point of view of officials, ecc. the rule is written and is for all clear. a pity situation, or? While i think it's nice that you acknowledge the art of serving 'tricky', your opinion is pretty unique and opposite to most TT-viewers opinions that seemed to be getting tired of watching 3-ball (or even 2-ball) 'rallies', which has been one of the reasons why the hidden serve rule has been implemented. Nowadays i see this rule rather as a moral thing pretty much like the booster rule since both rules are nearly impossible to be enforced properly. It's not a crime doing it, but a real Gentleman should be able to do without it. Last edited by Suga D; 11-26-2017 at 06:14 PM. Last edited by ttmonster; 11-26-2017 at 06:47 PM. A little bit off topic maybe, but cannot help posting Dima's replies in German forum. Really want to have this kind of insider discussions. Another Slow Motion Vidéo, with Dima this time !